This route will take you on a journey of disovery, to the most charming corners of Northern Ireland. On your journey you will see natural wonders such as the Giant's Causeway and the Antrim Valleys - a feast for the senses that inspired the successful Game of Thrones - an interesting cultural, gastronomic and leisurely experience at the amazing Titanic Belfast, a complete interactive center where you discover all the secrets of this famous ocean liner. Get into one of the famous black cabs and enjoy an unforgettable trip! Day 1: City of origin – Dublin. FASTEN YOUR SEATBELTS, BEGIN THE ADVENTURE. The flight to Dublin brings an exciting adventure that for 13 days and 12 nights invites you to enjoy Ireland, at your own pace. When you arrive at the airport in the Irish capital, collect your car at the rental agency. Remember that in Ireland they drive on the left (be careful of roundabouts) and the car controls are also on the opposite side. Head to the hotel, but do not unpack. You have one night to discover wonderful Dublin and, the next day, you will begin this exciting journey. 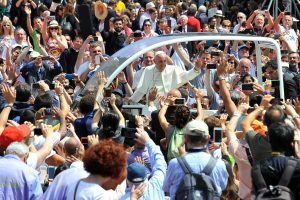 From 22 to 24 August, you will be able to attend the Pastoral Congress for the World Meeting of Families on the theme « The Gospel of the Family: Joy for the World » chosen by the Holy Father. The Congress will include an enriching program for adults with important speakers, workshops, lectures, testimonies and debates; a motivating and engaging program for young people, and fun activities for children. There will also be a daily celebration of the Eucharist, prayer activities, cultural events and music concerts. In addition, during these days you can visit Dublin, the lively capital of Ireland. 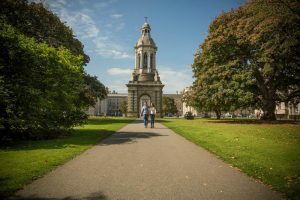 We recommend you to visit some of its most famous attractions such as the beautiful St. Patrick’s Cathedral, Dublin Castle, Trinity College, Ireland’s oldest university and where you can visit its magnificent library, Town Hall, National Gallery of Ireland, Phoenix Park or the Dublinia exhibition. And if you’re a beer lover, you cannot miss the genuine Guinness Storehouse, where you can try one of the most famous beers in the world. Today you have all morning free. We suggest you discover Dublin’s charms from the River Liffey. Join one of the exciting riverside excursions that run daily on the River Liffey! From a boat equipped with all the comforts and thanks to an expert guide, you will be able to find out about the important historical stages of the city, from the arrival of the vikings a millennium ago, to the important development that the city experienced in the nineteenth century and the significant work of rehabilitation of the docks. During your boat trip, you will be able to recall outstanding legends and photograph outstanding tourist attractions of the city. During the river tour you will cross famous sites such as the Ha ‘Penny bridge or the Grand Canal. And if you prefer to explore Dublin by land you can get on some of the colorful tour buses that run through the city and stop in the most significant places. In the afternoon, the Grand Festival of Families will take place, one of the most beautiful and significant events of the World Meeting of Families. It is a celebration of family life around the world with music and dance shows, as well as the testimony of faith of five families chosen from different parts of the world. You’ll love it. Today the World Meeting of Families concludes with a solemn Eucharistic Celebration which will bring together people and families from all over the world in communion and thanksgiving. Afterwards, we recommend traveling to the small fishing village of Howth, just 20 minutes by train from Dublin. This ancient fishing peninnsula is visited by numerous tourists attracted by its interesting bird observatory. Also, marine mammals, such as seals, often come to the port to be fed by visitors. In Howth, the castle of the same name, owned by the Gaisford St. Lawrence family, resides there. Although you can not visit its interior, it can be enjoyable to visit its elegant gardens. Near Howth, you will find Ireland’s eye where the ecclesiastical remains of an ancient monastery are preserved and from where a great variety of birds can be observed. The Ireland’s Eye can be visited exclusively in summer, so you’re very lucky. Do not miss it! Back in Dublin, we encourage you to leisurely wander the mythical Ha’Penny Bridge to the picturesque streets of the Temple Bar area that will catch you for its constant lively nightlife that focuses on its historic pubs where you can enjoy with the cozy dublin chords of traditional music and refreshing pints. Here’s to a good night! After a good breakfast, it’s time to head to Belfast in your rental car. At your own pace, we recommend that you enjoy the road and the wonderful landscapes making stops in small towns alony the way. Thus, in the Boyne Valley, you can make a stop to discover the interpretive center of Brú na Bóinne, where you will find a detailed explanation of the Neolithic monuments of Newgrange, Knowth and Dowth. Before arriving in Belfast, you can visit Armagh, the ecclesiastical capital of Ireland. The rugged mountains, splendid lakes and the dramatic coastline make it the ideal destination for nature enthusiasts. Your accommodation awaits you in Belfast. Day 8 (Day 28 of August): Belfast – Region of Antrim. BELFAST, FROM THE NORTH CAPITAL TO THE BOOTS OF THE GIANTS. On the eighth day, you will wake up in the capital of Northern Ireland. There is no time to waste, take advantage of this morning to discover the city of Belfast, located in a picturesque setting between the mountains and the coast, and learn the history of a town that has managed to overcome more than 20 years of conflict. Do not forget to visit the four Victorian city districts: The Cathedral Quarter, the Titanic Quarter, the University Quarter and the Gaeltacht Quarter. After a break, it is time to return to the car to continue along the northern route, along the coast through the nine gorges of Antrim, to reach the feature known as the Giant’s Causeway, an impressive place that dazzles whoever visits, where thousands of columns of volcanic stone (almost all hexagonal and large) are joined together, stepped down the mountain slope and sinking into the sea, which has given rise to many legends about its creation. Accommodation. After breakfast you have all day to continue enjoying this magnificent region, which offers sublime landscapes, an exceptionally beautiful coast, historical castles, beautiful glens and bustling cities. The road through which you will drive meanders to the northeastern edge of the island, with breathtaking views from the high cliffs. If you are curious about how whiskey is made, we woud recommend you pay a visit to the oldest distillery in the world at Bushmills. Four centuries of history and tradition guarantee the production of this precious drink. Accommodation. Day 10 (Day 30 of August): Region of Antrim – Derry – Region of Donegal DERRY OR LONDONDERRY? After breakfast, head in your rental car to the city of Derry (as the Catholics know it) or Londonderry (as the Protestants call it). It is a walled city that was built following the schemes of the Roman camps, on the banks of the river Foyle. You can not miss its fortified square and the award-winning Tower Museum, which offers a complete view of the city’s history from pre-Hispanic times to the present day. Then it is time to continue the march towards the Donegal Region, following the coast road you will pass by small cliffs, rugged landscapes and perfect spots for lovers of photography and nature. Accommodation. On the tenth day of your adventure we invite you to marvel at one of the less visited areas of Ireland, but by no means less interesting, the counties of Donegal and Sligo. There you can see places like Lake Fermanagh, Enniskillen, the the Marble Arch Caves or the majestic castle of Coole. Let yourself be seduced by Sligo’s incredible mix of history and breathtaking scenery. Filled with literary history, Sligo is one of the most picturesque counties in the north-west which inspired WB Yeats’ poetry, and boasts beautiful mountain scenery like clear lakes and wonderful beaches perched on the edge of the Atlantic. Sligo town in contrast, however, is a small, bustling and lively town with good restaurants where you can enjoy succulent food and shops to make you remember your getaway in Northern Ireland. After more than a week of cliffs, castles, green landscapes and lively localities, it is time to make your way way south. You can use it to stop at the points you missed or to take pictures in a different light. Enjoy the journey, let the beauty of the road be engraved in your memory and say goodbye to the highlands of Ireland. When you arrive in Dublin where you will spend the night, you still have one night in the capital to take advantage of the last hours in a good restaurant or buy the last of your souveneirs. Last breakfast on the Emerald Isle. Head to the airport, sure the road is familiar, but after 13 days of intense adventures, you will feel that you are much more than a visitor. You will be comfortable on the Irish roads and in your heart and your suitcase will be thousands of wonderful memories to take back with you. We hope you enjoyed the trip! Head to Ireland and take part in the World Meeting of Families to be held in Dublin from 21 to 26 August 2018. A unique opportunity to experience with your loved ones an unforgettable journey that will transform your lives forever. Can you think of a better way to spend your summer vacation? WELCOME TO THE EMERALD ISLE! Take a spiritual journey in which you will also get to know the cosmopolitan and friendly city of Dublin and discover an important historical and cultural legacy, a lively and fun atmosphere, delicious choice of cuisine and the beautiful landscapes that have given so much to this European country. Come and enjoy with your family and friends a unique experience in which you can live your faith together with Pope Francis, feel the strength of spiritual communion and share experiences with families and young people from all corners of the world. Don’t miss it! Personalities such as Jonathan Swift, Samuel Beckett and Oscar Wilde studied here. Did you know that Trinity College Dublin is the oldest university in Ireland and one of the most prestigious in the world? Founded in 1592 by Queen Elizabeth I, international personalities such as Oscar Wilde, Jonathan Swift and Samuel Beckett passed through their classrooms. Its rich library condenses the cultural wealth of the city, whose crown jewel is the « Book of Kells ». And it is that Trinity owns the largest collection of manuscripts and printed books in Ireland. Since 1801, Trinity Library has received a copy of all the works published in Ireland and Great Britain, thanks to which it currently has almost three million books distributed in eight buildings. During your visit we recommend that you get lost in all its corners, relax in its small parks, admire its elegant buildings from the 18th and 19th centuries that contrast with contemporary sculptures such as Henry Moore and soak up the university atmosphere. As soon as you enter the main door you will find the bell tower, about 30 meters in height, designed by Edward Lanyon and erected in 1853 in the place where the center of the old monastery is believed to have been. On the north side of the square stands the chapel, designed by William Chambers and finished in 1799. You can only see its interior by previously arranging a guided tour. The Dining Hall, the Library Square, the Douglas Hyde Gallery, the Science Gallery and the Samuel Beckett Theater are just some of the attractions of this academic campus which offers the visitor a traditional and modern city. The visit to Trinity College is a must-see during a trip to Dublin. It is so enjoyable to walk around the campus admiring the buildings that compose it, besides going back to the past with the books of the Old Library, or to contemplate the magnificent work of art of the Book of Kells. The price for the Old Library and Book of Kells are approximately 11 euros. 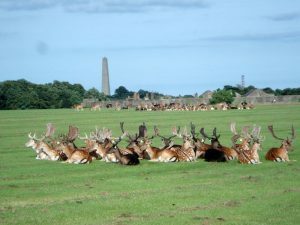 With more than 700 hectares of extension, the Phoenix Park is the largest urban park in Europe. Created in 1662 as a deer reserve, in 1745 it was remodeled and opened to the public. Located just a few miles from Dublin city centre, the Phoenix Park is an important green space for the city, as well as a pleasant place to bike. Dublin Zoo. Visiting the zoo, one of the oldest in the world, is always a good option to enjoy nature in the middle of the city. Frequented by locals and tourists from all over the world, it was inaugurated in 1830 with a single resident: a wild boar. Papal Cross. Discover this cross located in the place where in 1979 the Pope celebrated a mass before a million followers. Wellington Monument. Take a picture of yourself in front of this obelisk which is 63 meters in height, erected in honor to the Duke of Wellington. It took more than 40 years to build. Áras an Uachtaráin. The official residence of the President of Ireland. The park is open all day. You will need between three to four hours to visit it. 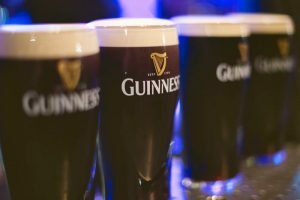 If you are a beer lover, you can not leave Dublin without visiting the Guinness Storehouse, one of the most authentic places in the city. During your visit, you will have the opportunity to find out informaiton about the history and production of the most favoured drink in these lands. Its reddish color, its characteristic smell and its intense flavor have made of the pint one of the preferred pleasures of Dubliners. The visit to the Guinness Storehouse begins on the ground floor of the main building, which you will recognise for its curious form of enormous pint of beer. Here you can see the copy of the brewery lease signed by Arthur Guinness in 1759 for 9,000 years and an interesting exhibition where you will know all the secrets surrounding the four ingredients that make up the beer: water, hops, barley and yeast. On the first floor, the process of brewing is explained. A large room contains the old machinery used in the factory: a mill, a toaster, a alembic and giant wooden barrels. For its part, the second floor offers the visitor an interesting tour through the history of this emblematic beer that you will know thanks to the advertising campaigns developed by Guinness throughout history. On the third floor visitors are offered the possibility to test their knowledge about alcohol through different interactive games. On the fourth floor an exhibition tells the history of the building, from 1904 until its conversion in 2000 into a visitor center. At end of this excursion on the fifth floor, visitors are offered the chance to pull their own pint, giving them a diploma that credits their skills. The tour finishes on the roof of the building, known as Gravity Bar, a pleasant place from which you can admire the views of the city while tasting a pint on the house. A unique experience. Open every day from 9:30 a.m. to 5:00 p.m. (July and August from 9:00 a.m. to 7:00 p.m.). Embark on a leisurely cruise and discover all the secrets of the River Liffey and the charming city of Dublin. While you enjoy some of the country’s most beautiful scenery, you will learn from an expert guide the history of this city, since the arrival of the Vikings, 1000 years ago, the apogee and development of the eighteenth and nineteenth centuries, the rehabilitation of the Dublin quays and the many attractions that have turned this city into one of the main European capitals. 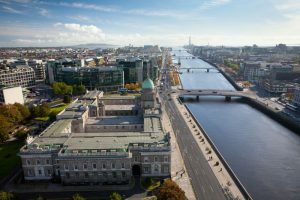 During the crossing, you will cross the symbolic Ha’penny Bridge, the majestic Custom House, the Royal Canal and the Grand Canal, as well as discovering that much of modern Dublin sits on land reclaimed from the sea, which includes Trinity College and The Spire on O’Connell Street. The ship has the capacity to accommodate 48 passengers and offers all the facilities and services that guarantee a comfortable and safe voyage. The boat is ready for rain. 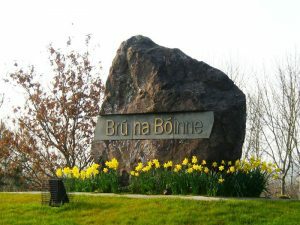 The interpretation center of Brú na Bóinne is located about 8 kilometers inland from Drogheda and covers an area between the towns of Slane and Drogheda Boyne Valley. For lovers of History and Archeology, the Brú na Bóinne Visitor Center is an unrepeatable experience that will allow you to discover the characteristics of the Neolithic constructions of Newgrange, Knowth and Dowth, considered a World Heritage Site. The center, which overlooks the core of the archaeological landscape, includes exhibits where you will learn how prehistoric settlers created the neolithic tombs, their homes, clothing, food, tools and weapons. The extensive exhibition also contains a life-size partial replica of the Newgrange chamber as well as a replica of one of the smaller sites in Knowth. You can see the remains of about forty tombs that are the oldest remnants of human activity in the area that still remain. Are you ready to discover them? The Visitor Center is the starting point for all visits to Newgrange and Knowth, and there is a shuttle bus service to these monuments from the bus stop located 300 m from the Center on the north bank of the River Boyne. Both Newgrange and Knowth are outdoor locations and there are no shelters. Do not forget to bring appropriate clothes and an umbrella, just in case. GIANT’S CAUSEWAY MYTHOLOGY OR GEOLOGY? The Giant’s Causeway is a spectacular formation of 40,000 hexagonal and pentagonal columns, whose geological origin is derived from the cooling of lava in a crater, about 60 million years ago. However, the mythological explanation described in the Celtic legend of the island speaks of the struggle between two giants, one Scottish -Staffa and another Irishman -Finn MacCool-. According to the legend, this rock formation is the fruit of the confrontation between them both, that gave victory to the Irish giant. 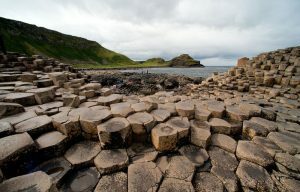 In addition to the rocky causeway, along the way you will find wonderful formations such as the so-called « giant’s boot » which, according to legend, is the petrified boot of Finn, the giant builder of the causeway. At the visitor center, you will have the opportunity to learn both the geological explanation of this interesting formation, and the details of the legend of the giant Finn McCool. Myth or legend? It will be you who decide the true origin of this impressive formation. The best time of day t osee the Causeway is the last two hours of sunlight, especially in spring and autumn, when the light hits it sideways and stains the rocks golden. To know the history of the city of Derry, nothing better than to approach the Tower Museum. This medieval-style building houses a detailed exhibition that transports the visitor from the monastic origins of the city to the present day, passing through the seventeenth century colony of the original site, emigration in the nineteenth century, the division of Ireland between Protestants and Catholics and World War II. 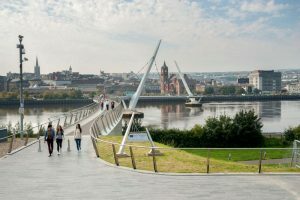 Today, after years of conflict, Derry and Londonderry are two names for a people living as one, united by peace, which is certainly worth knowing. Derry is also the only walled city on the whole island. With an extension of more than a kilometer and a half of perimeter, eight meters of height and more of nine of thickness, the walls protect the heart of the city. Come and listen to the secrets that reveal these ancient walls, which have four access doors: Bishop’s, south, Ferryquay, east, Shipquay to the north, and Butchers Gate to the west. Take advantage of your visit to Derry to discover the magic of local live music. The most famous pub is Peadar O’Donnell’s, which offers performances by local musicians every night. 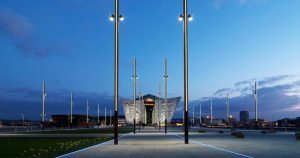 Inaugurated in 2012 to mark the centenary of its sinking, Titanic Belfast is an impressive interpretation center located in the same place where the transatlantic liner was built. Everyone has heard of the famous sinking, however, few know that its construction began in the city of Belfast. Therefore, this city wanted to pay homage and designed a building with the same height as the ship itself, composed of nine galleries scattered throughout its six floors. Its height of 27 meters coincides with the Titanic from the keel to the bridge, and has capacity for 3,547 visitors at a time, the same capacity as the boat itself. You can not miss this symbol of the naval legacy of the city which has nine galleries that run through the history from the industrial city of Belfast to the place where the Titanic lies today. Digital images, special effects and 3D offers a detailed tour of the ship, from the engine room to the captain’s bridge. Welcome aboard, but rest assured this boat will remain afloat for many years. There is a reduced rate (‘Later saver ticket’) for those who want to vist during the last hour. Besides everything related to the famous Titanic, you can not miss the oceanographic center. It contains an exhibition dedicated to marine exploration to discover life under water, shipwrecks and more secrets hidden in the oceans.